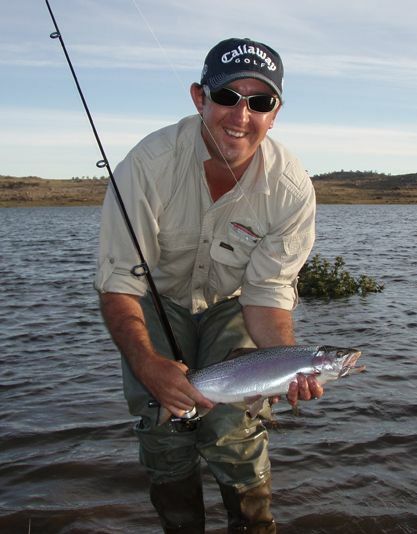 With the fantastic weather of late the fishing has continued to be excellent on fly in the lake Eucumbene with heaps of fish about and some good quality. Bait fishing has also been good and some nice fish being caught on mudeyes and powerbait. Rivers:- Are fishing very well at present with the excellent conditions. Try any small emerger patterns, stimulators, humpy, klinkhamer and nymphs. Lake Eucumbene:- Fly reports have been fantatsic on the whole. The lake has been fishing really well both during the day and the evenings. He also landed a 3lb brown. Muddler style flies were the go. 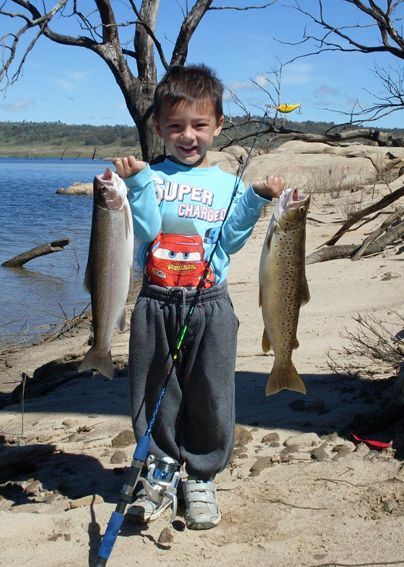 Lake Jindabyne:- Jindabyne reports have been quiet though the night fishing should be similar to Eucumbene. Sids and Rushes bay, Kalkite are all worth a look as is Hatchery bay, Hayshed bay and Curisoity rocks. Eucumbene:- Eucumbene trolling reports have picked up a little with one group reportedly catching twenty fish on flatline tassies during a single session. Lots of bust offs and lost fish all day!!! came back next day at 12pm!!! same conditions to get fish all day hooked 20 fish for the day and brought home 3 more fat rainbows on wets and snowy minnows all fish were in shallows feeding up on stick caddis and water snails after dark got even better best weekend i have fished for some time will return soon. Heres a pic of my 4yr old son Jake. Jindy is trolling well in the morning and early evenings. Both lead line and flat lines catching great condition fish. Mostly bows but the odd brown is around. Lake surface temp is hovering around 19-20 degrees. Fav lures at the moment are pink lady Tassie ( which is more of a mauve colour) before sunrise and 43 cobras. Dad and I hit Yens Bay on Saturday, perfect conditions but little or no visible fish. We did get 4 solid Rainbows up to just under 1kg on live Mudeyes but nothing what so ever on Fly or Lure and we tried a number of different tactics. Had a look at Wollondibby on Sunday, Jindabyne looks to have come up slightly and looks excellent and all though we spotted quite a few rising and cruising fish none were willing to play so struck out. Just the one photo, of one the Bows from Yens. *Alan Hocking, John Pene and John Nowak had a good couple of sessions in the Middilingbank arm catching some great fish on Lemon and Lime twist. Alan holding up some of the better fish. Bob & Chris Marek had a great morning fishing off the bank this morning. They caught 7 Rainbow Trout weighing between 637 - 829gms, all before they even put the boat in the water. They used Gulp "Rainbow Candy" dough. Narooma Sporting Services Fishing Club had their fishing competition here last weekend. All up 45 fish were caught. Overall winner was Dave Clark.